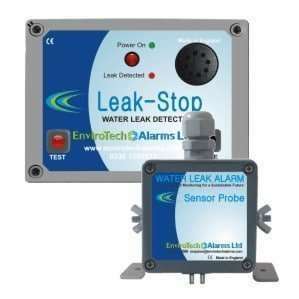 Build your own single zone water leak detection system using the LeakStopper 1 alarm panel. Add sensor tape, probes and pads to fit the environment where you need to detect water leaks. Ideal for Plant Rooms, Comms Rooms and pipe runs where a leak could cause problems and damage. Start with the versatile LeakStopper 1 (comes with battery backup and connections to BMS, solenoid valves and external devices as standard), add connection cable and choose between sensor tape, sensor probes and sensor pads. Quantities can be selected relative to the size of the area requiring cover (i.e. 20m of sensor tape will cover a 5m x 5m area when installed around the periphery of the room, or 4 sensor pads can be selected to protect 4 drip trays under an AC unit). Why not add an optional valve to switch the water off or a text dialler that will let you know there’s an alarm even out of hours. Once you have selected the appropriate length of tape, you will also need the fixing kit below. We manufacture our alarm panels using the highest quality components there are, as such building in reliability and trouble free operation. The LeakStopper 1 range is also covered by our 1 year warrenty offering you extra peace of mind in the unlikely event that anything should happen. Our expert technical support team are on hand should you wish to discuss anything regarding the installation or operation of the system. Helping the construction industry achieve BREEAM compliance. BREEAM is a registered trade mark of the Building Research Establishment Limited, a wholly owned subsidiary of BRE Group Limited. » Their logo is used by permission. EnviroTech Alarms Ltd. and its products are not affiliated or certified by BRE Global Limited, which is the operator of BREEAM. Products can only achieve BREEAM certification, based on use and application at any individual site, from a licensed BREEAM assessor. © Copyright 2018 Envirotech Alarms Ltd. All rights reserved.